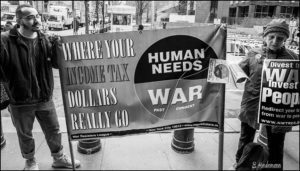 For articles and interviews with war tax resisters during tax season and from tax day actions, see tax season articles and recorded interviews and podcasts. Kathy Kelly, left, leafleting at the penny poll in downtown Colorado Springs, April 13. Even though agriculture didn’t get a large percentage, it was still twice as much as the military got. 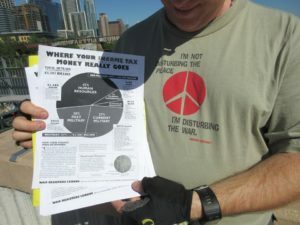 We handed out the WRL pie chart and a local flyer to voters and also to others who took them, saying they needed to run. 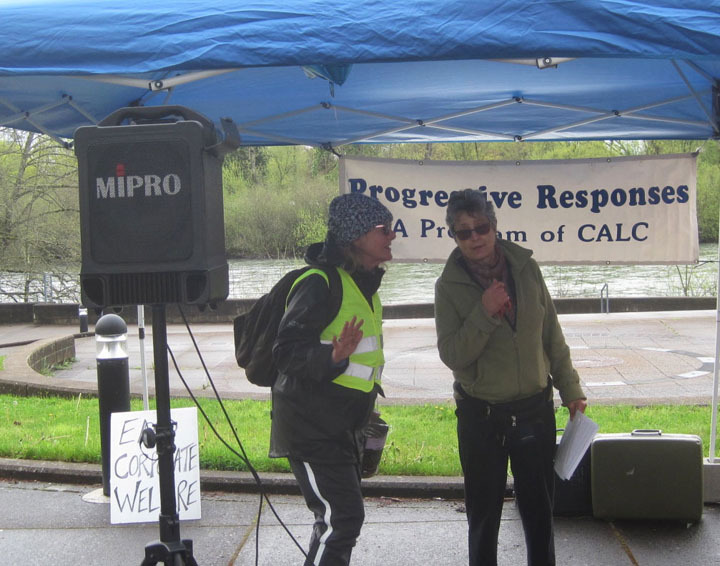 We had Kathy Kelly‘s help as she’s been teaching a nonviolence class and was around to finish up some speaking gigs here. We’re happy for the results of the poll and the opportunity it gave us to talk with folks, so maybe Friday the 13th was lucky after all! 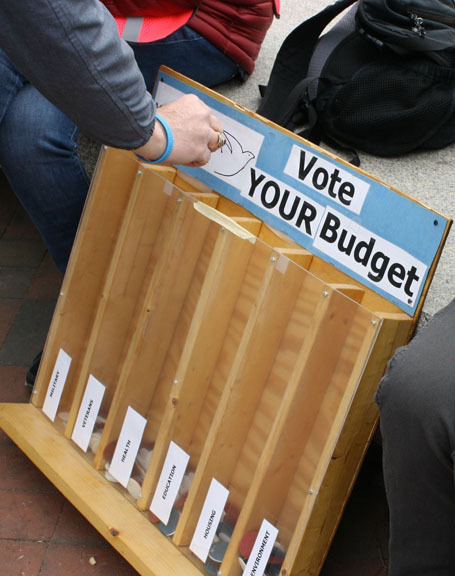 Here’s a video of the penny poll action as well! 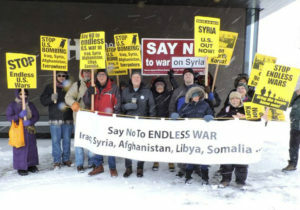 We had a record breaking snowstorm over the weekend of April 14-15 (over a foot of snow and still coming down as we stood with our signs) so instead of having a march we stayed at the corner for an hour with our antiwar signs, some chants (“1-2-3-4-we say no to endless war. 5-6-7-8-we will not cooperate” and “Money for jobs and education not for bombs and occupation”) and then three speakers: one on a general antiwar theme deploring the bombing of Syria, me on taking the next step of resistance and divesting from Trump’s budget through war tax refusal, and a member of Veterans For Peace on holding the warmongers criminally responsible. There had been a number of other speakers lined up but none of them was able to make it. 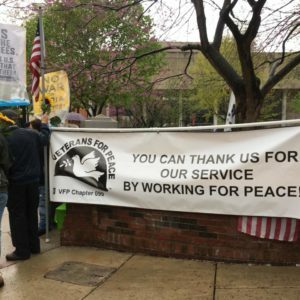 Despite the weather more than 50 people showed up! 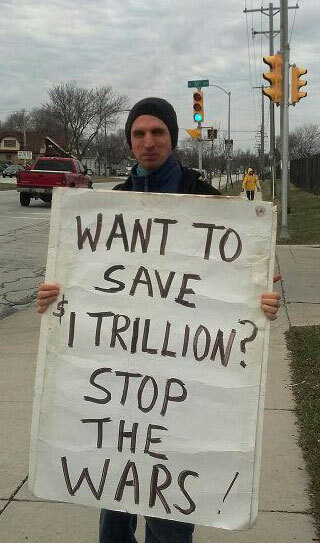 The next MN War Tax Resisters activity will be at the MAYDAY parade when hopefully the weather will be more clement. 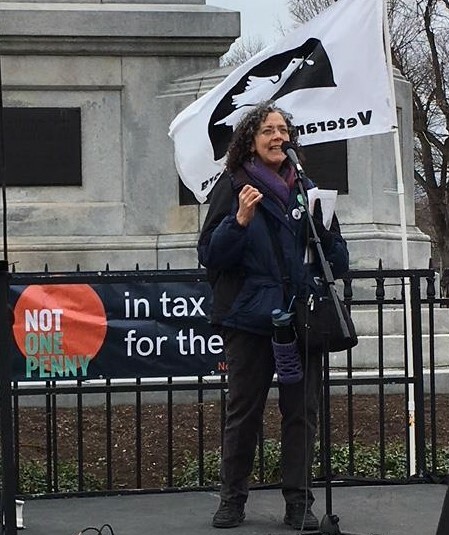 Boston held its annual Tax Day Rally in support of the People’s Budget. More than 100 people attended, but fewer than last year. 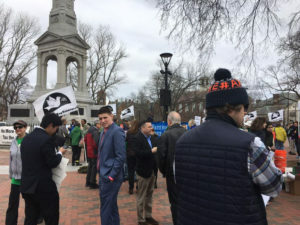 There were many sponsors including No One Penny, Mass Alliance of HUD Tenants, Veterans for Peace, Boston Teachers Union, Mass Peace Action, Women’s International League for Peace and Freedom, American Friends Service Committee, and New England War Tax Resistance (NEWTR) endorsed the rally. Speakers included: U.S. Representative Michael Capuano, Cambridge Black Lives Matter; Joe Gerson, American Friends Service Committee; plus seniors, housing advocates, candidates for governor, Secretary of State, and Lt. Governor. 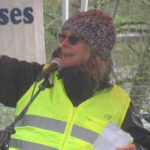 Mary Regan from NEWTR spoke about war tax resistance and our Alternative Fund. 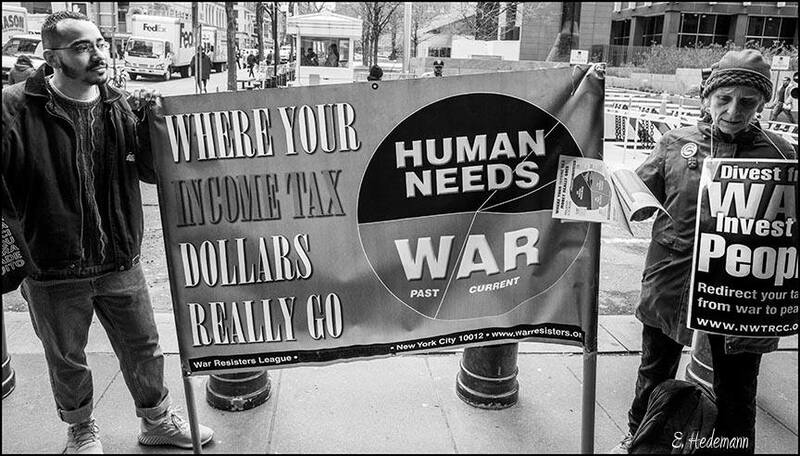 This year we donated $6,900 from resisted taxes to local organizations working for a just and peaceful world. These groups were Asian American Resource Workshop, Beantown Society, Boston Mobilization, Dorchester People for Peace, Maine WTR Resource Center, Men Teach-New England, Reclaim Roxbury, Student Immigration Movement, The Youth Justice and Power Union, Traprock Center for Peace and Justice. 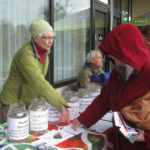 NEWTR also had a table to talk about WTR and held a Penny Poll, which almost 100 people participated in. 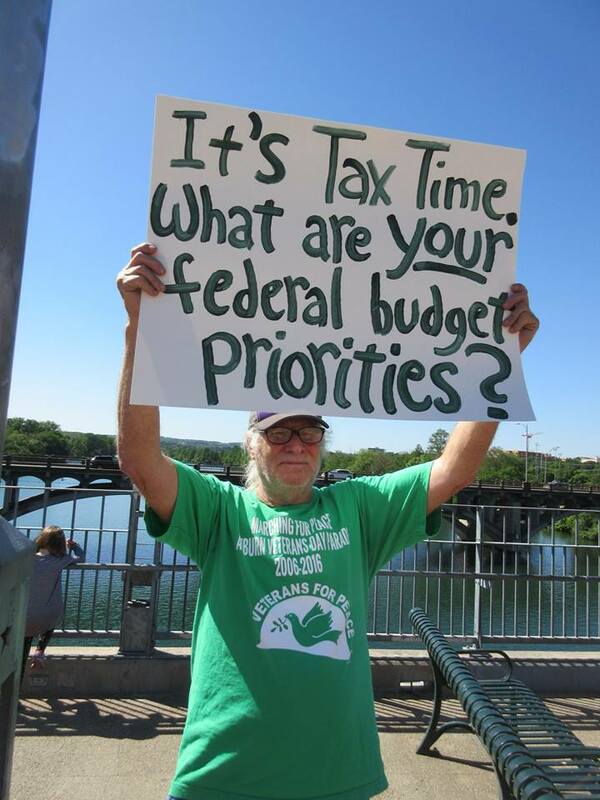 It was well worth the time and effort to be part of this coalition on tax day. Unitarian Universalists for Social Justice Peace Task Force. Their “penny” poll used “democracy dollars” for passers-by to choose where they want their money to go. Click here for more photos by Charles Paidock. 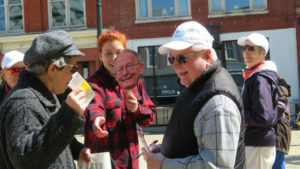 A noontime event was held on tax day outside of Congressman John Faso’s Kingston office at 721 Broadway in Kingston. Approximately 40 people braved the cool, breezy and slightly damp sidewalk telling Congressman Faso’s environs that people want to “Cut War Spending and Fund Human Needs”. 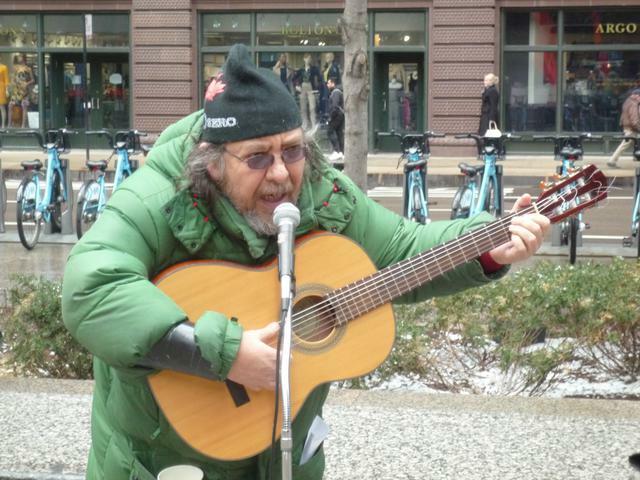 With a focus on paying taxes for peace instead of war, songs with traditional as well as alternative lyrics were sung. 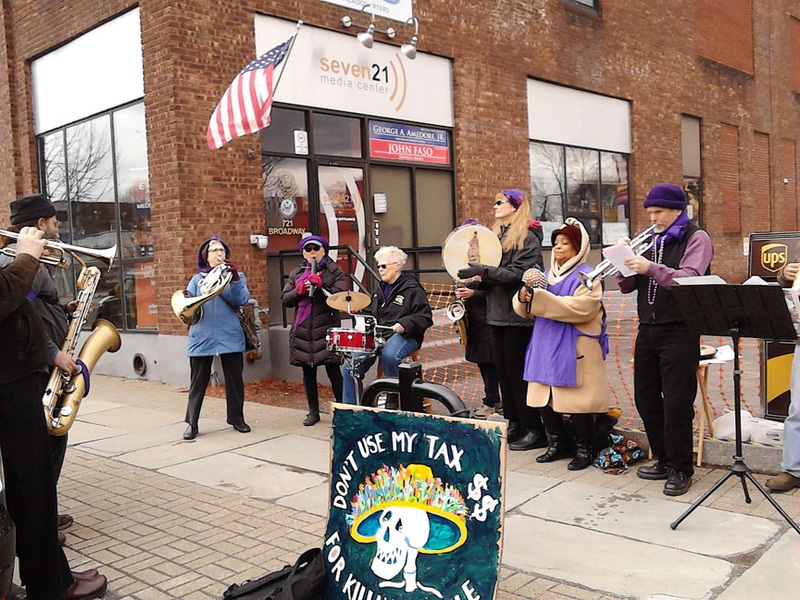 Tin Horn Uprising band at the Tax Day rally in Kingston, NY. 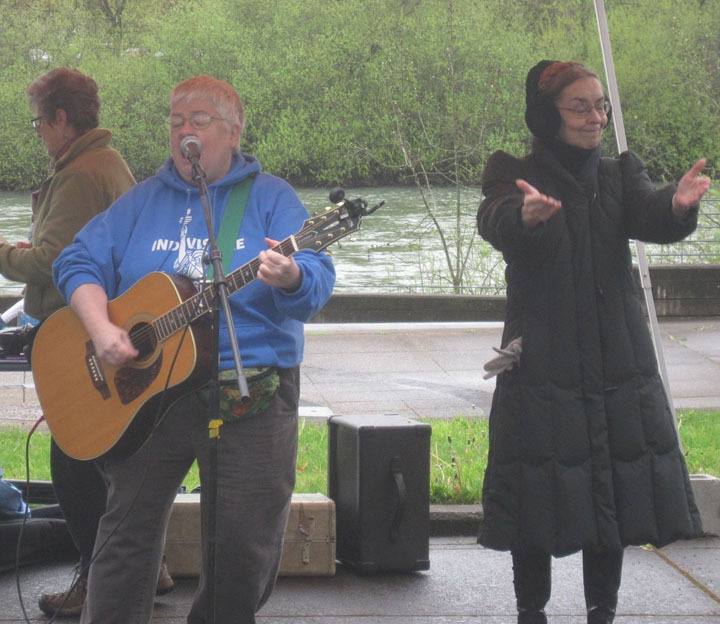 Members of Rise Up Hudson Valley, Citizen Action Kingston, and musicians from Tin Horn Uprising joined others that came in support to sing songs such as Wade in the Water, Get Up Stand Up and We Shall Overcome. People followed along on song sheets while 8 Tin Horn Uprising activist street band members played the musical interludes. With signs such as “Half of Federal Tax $ Pays for War Making”, “Invest in Kids not War” and “Make America Kind Again”, the lunch time of serious singing ended on a sweet note. 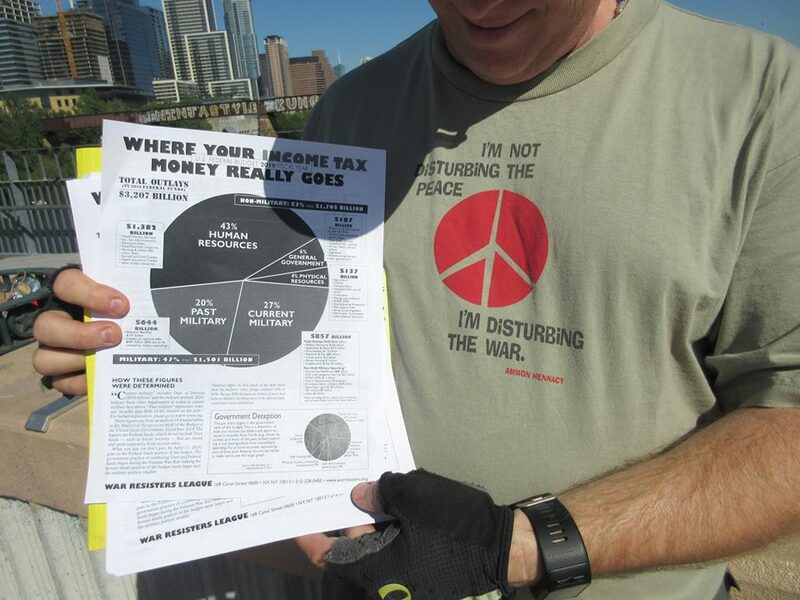 Well sort of… Copies of War Resisters League “Pie Chart” were distributed showing that almost 1/2 our federal tax dollar pays for war. So the gathered crowd got to share in the Apple Pie from which each person got a VERY SMALL piece while the Pentagon got the vast lion’s share. 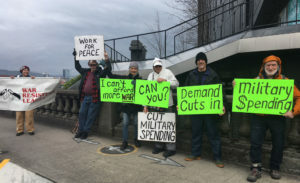 And though the staff at Congressman Faso’s office declined accepting our “gift” of the 1/2 Pie (Pentagon’s Slice), we were able to pass along a few pie charts and ask that next time the Congressman NOT vote for an additional $70 billion in defense authorizations that were not event requested. 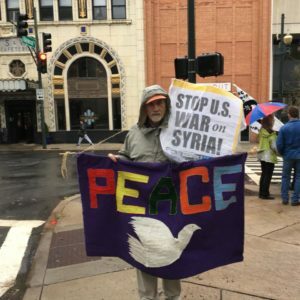 Instead of sending more tomahawk missiles at a cost of $1.4 million each to threaten global warfare, as we did with 66 such missiles in Syria last Friday, we would rather have that money spent to better our schools, health care system and housing and job programs for Americans that need help. 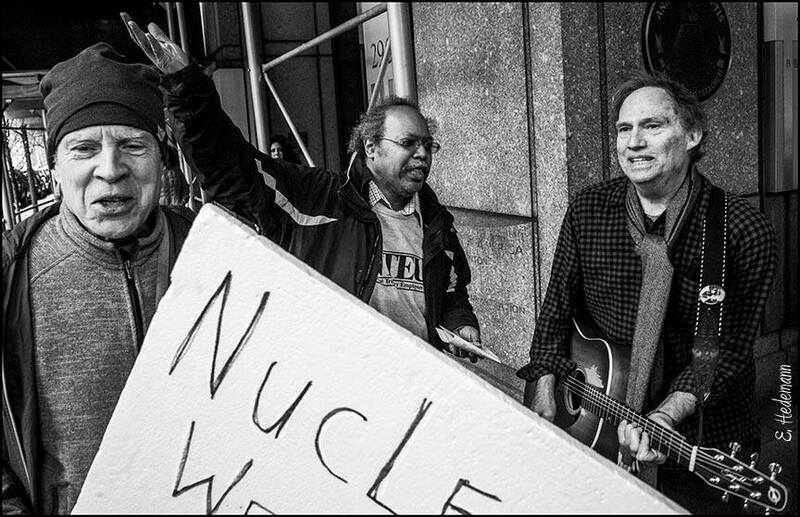 See more photos on the Hudson Valley Citizen Action Facebook page and look for Tin Horn Uprising activist street band on Facebook too. 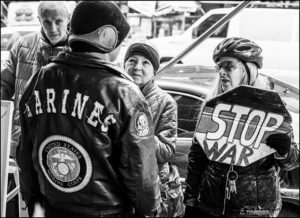 — Photo and report by Daniel Woodham. 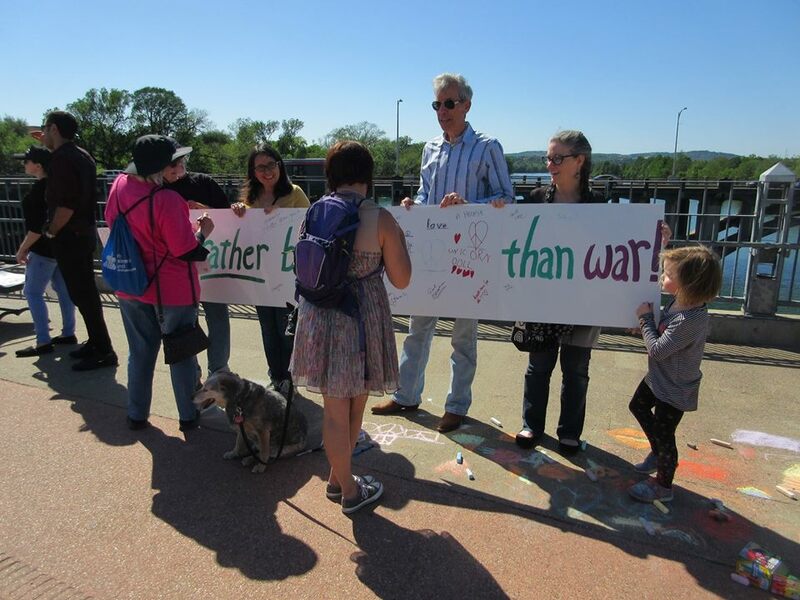 On Sunday afternoon, April 15, we held a long poster banner reading, “I’d rather buy ___ than war!” on a pedestrian bridge downtown where many folks walk or bike. 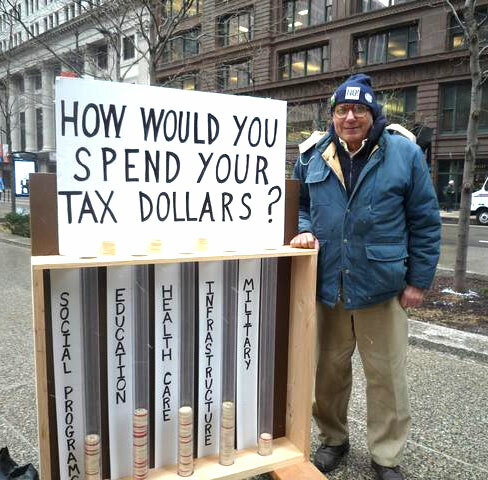 We offered markers to passersby and invited them to write in the blank, and many did. 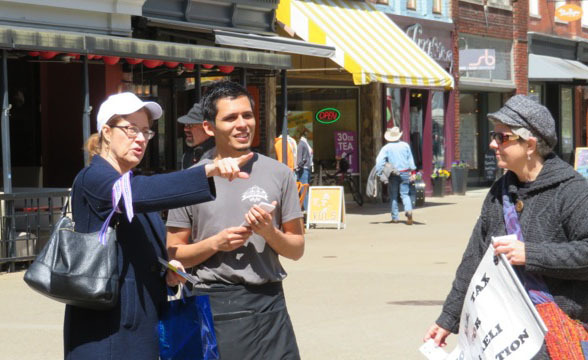 It was a positive, interactive event, and we really appreciated the responses, most of which centered on education, health care, food, pets and the environment. A favorite moment was when a couple walked by saying that, just a few minutes before, they had become engaged. We cheered, and they wrote “our wedding” on the banner. Annual Tax Day peace vigil at Raytheon Missile Systems sponsored by the Raytheon Peacemakers. Find out about future actions at nukeresister.org/future-actions or see the Nuclear Resister Facebook page. 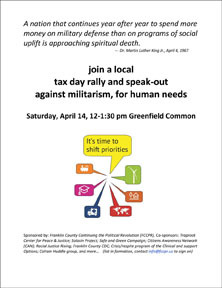 Franklin County Continuing the Political Revolution (FC CPR) Peace Task Force sponsored a rally on the Greenfield common on Saturday, April 14, fifteen hours after the U.S. launched missiles at Syria. See photos and read about the action here. — Report and link from Anna Gyorgy. 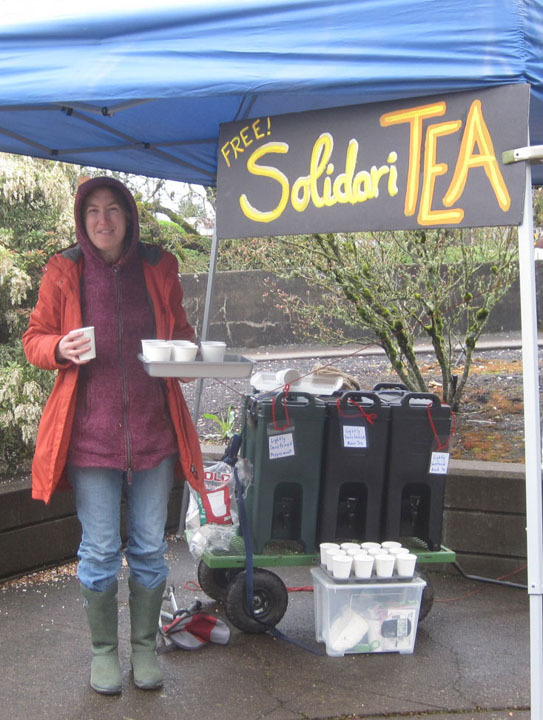 Clare Hanrahan shares these photos from their Tax Day gathering. 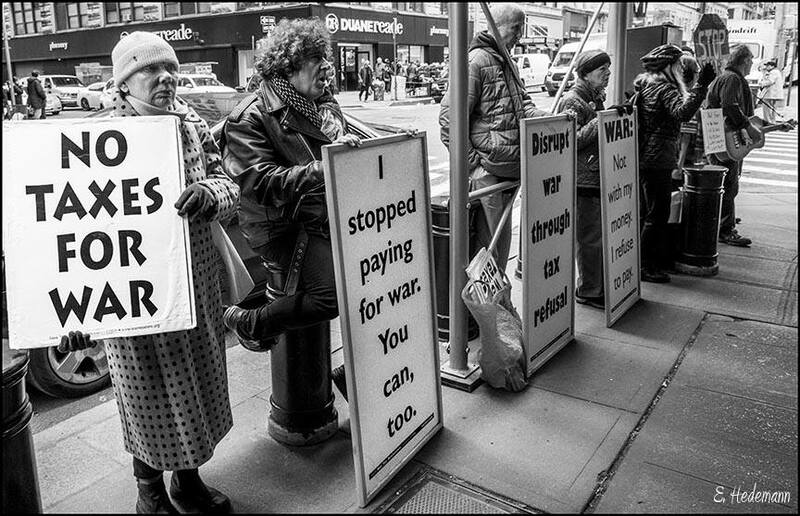 NYC War Resisters League and war tax resisters, Catholic Worker, Kairos, World Can’t Wait, Veterans for Peace/Chapter 34, NYC Metro Raging Grannies, Brooklyn For Peace, Granny Peace Brigade joined together for a picket and vigil at the Manhattan IRS office. The group handed out WRL “where your income tax money really goes” flyers while members of Filthy Rotten System drew attention to the event with music. 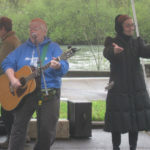 Raging Grannies helped with the vocals. 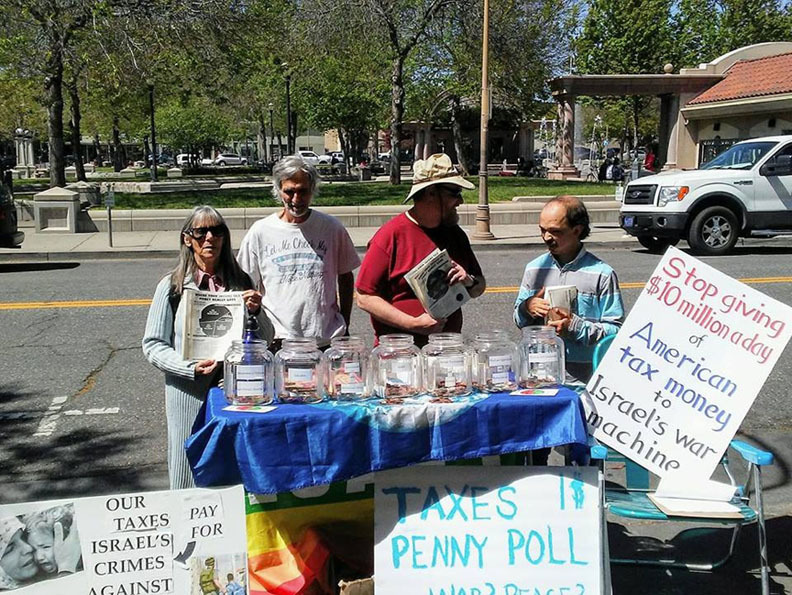 Besides being tax day, the group joined the action to the international Global Days of Action on Military Spending, April 14 to May 3 initiated by the International Peace Bureau. 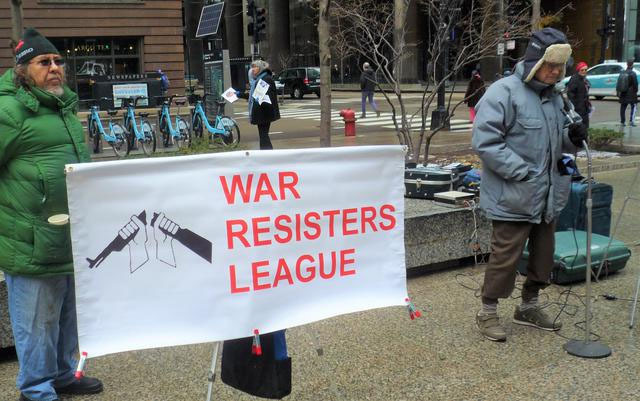 More photos on the NYC WRL Facebook page. A passer by stops to talk about stopping war. Photo ©Ed Hedemann. NYC Filthy Rotten System and guest singer, who apparently works for the IRS! Photo ©Ed Hedemann. 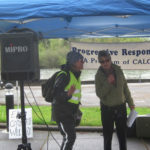 Community Alliance of Lane County, Eugene Taxes for Peace!, Indivisible Eugene, and other groups co-sponsored a rally and Tax March on Sunday, April 15. Over a hundred brave souls marched on a cold and rainy day along a route measured as a bar graph with military spending being the length of the march and stops along with way measuring how little is spent on human services and other needs. 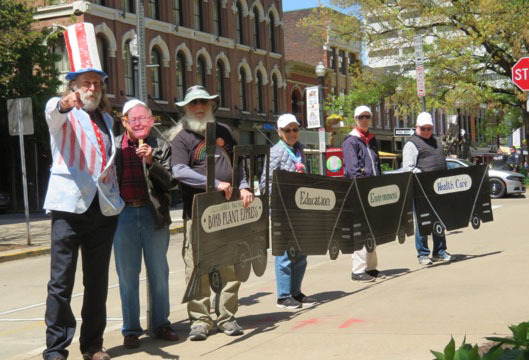 Folks held up signs along the way depicting how much we had walked for education, human services, etc… There were two stages, one at the beginning with singing and speakers and then one half way through with singing and holding up signs. The people wearing yellow vests were peacekeepers. Sue Barnhart and Loretta Houston conferring at the beginning of the rally. Do Mi singing Somos el Barco and being intrepreted by the sign language interpreter. 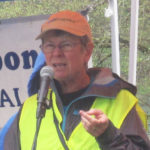 Patty Hines, co founder of our local 350.org group talking about money for the environment. Sue Barnhart encouraging folks to resist war taxes. 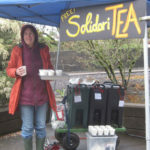 Solidaritea serving us hot tea in the cold cold day. 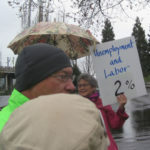 They come out to all our marches and rallies here in Eugene. 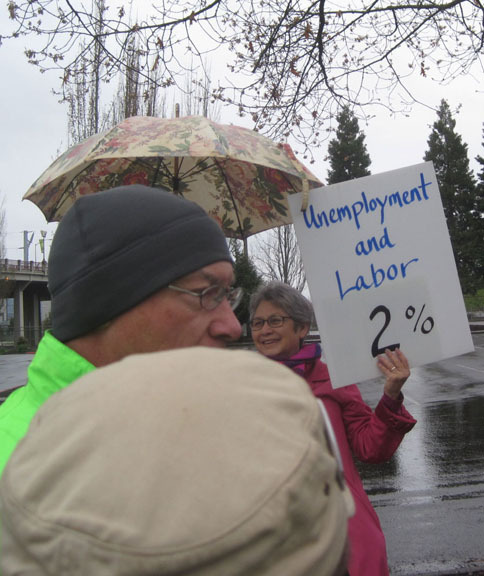 The March reaches 2% for unemployed and labor. 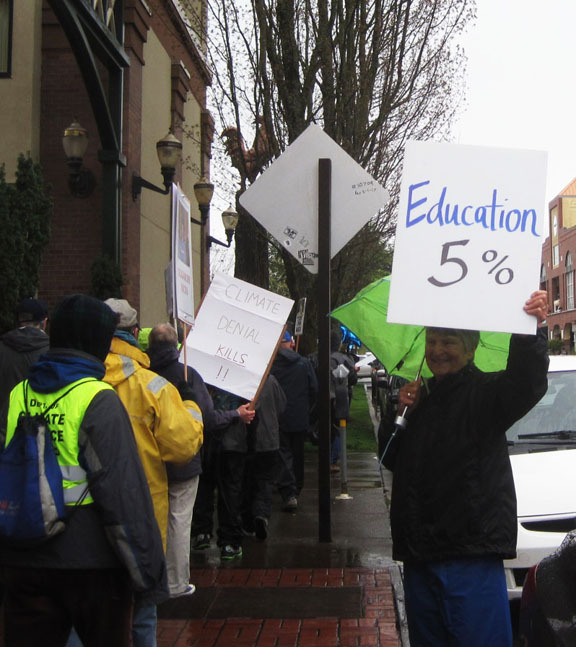 The March reaches 5% for education. Carol Van Hooten staffing penny poll Eugene 2018. Report by Sue Barnhart and photos by Jain Elliott. See a live stream from the event on the Taxes for Peace Facebook page. My daughter is an attorney and she sent me this which might be helpful to us and others in the future as we hold firm for the Commons and Free Speech: In United States v. Grace, (1983). 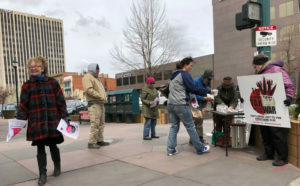 the Supreme Court held that a ban on leafleting, displaying flags, or picketing around the Supreme Court building grounds was unconstitutional. The Court acknowledged that the government had a significant interest in “provid[ing] for the protection of the building and grounds” as well as maintaining “proper order and decorum.” However, the Court found that by completely banning such mediums of expression, the statute burdened activities that “in [no] way obstructed the sidewalks or access to the building, threatened injury to any person or property, or … interfered with the orderly administration of the building or other parts of the grounds.” The broad sweep of the statute, therefore, did not “substantially serve[ ]” the government’s interests. 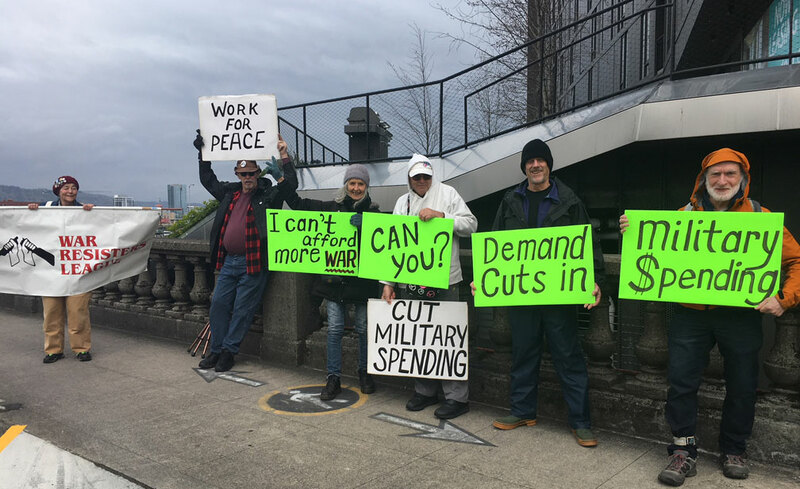 There were about a dozen of us in Portland who participated in the “Burma Shave” style action on two of the bridges near downtown. Lots of positive feedback and support from drivers and bikers passing by! An unscientific random poll of passersby on Knoxville’s Market Square during the noon hour on Tax Day provided clear results—more than 30 taxpayers designated their tax dollars to pay for environmental protection, education, and health care. 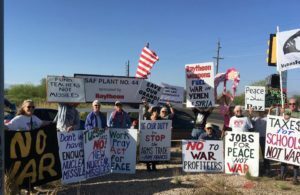 Zero taxpayers chose the Uranium Processing Facility bomb plant in Oak Ridge, TN. 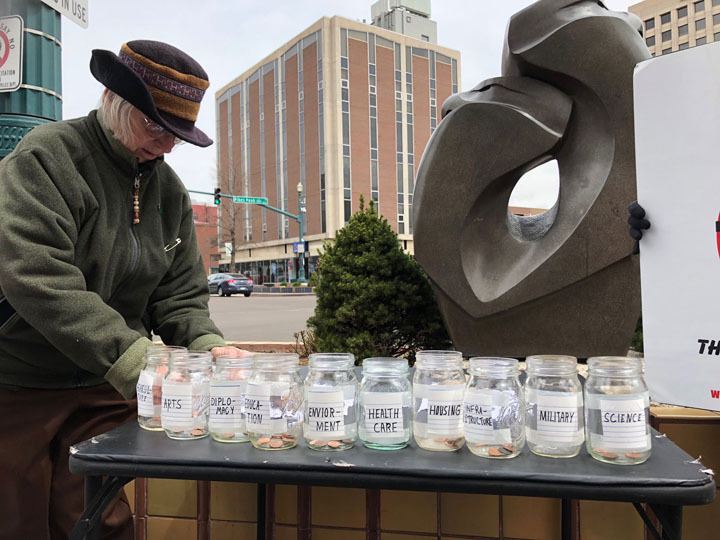 For the poll, passersby were asked if the would participate; those who agreed were given a packet of money ranging from $3,500 – $12,000, reflecting the federal tax burden for several typical Tennessee families. They were offered a chance to put their money toward the UPF bomb plant or three other programs. 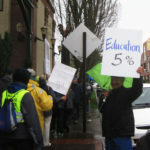 By the end of the day, Education had garnered $106,500; the Environment $77,500; and Health Care had pulled in $40,000. Unfortunately for the voters, even before their money could be deposited, “Senator Lamar Alexander” swooped in and snatched it away, taking it to the front engine of the Bomb Plant Express train where it would be used to build the UPF bomb plant in Oak Ridge. 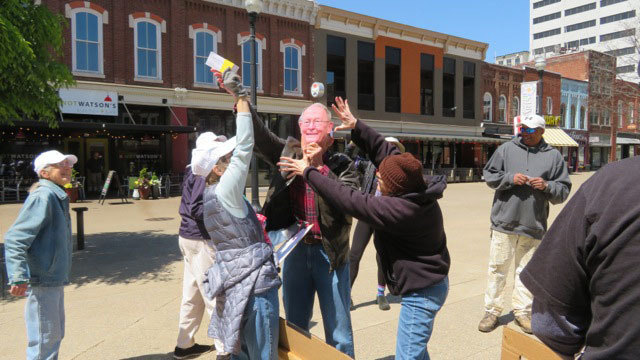 Several voters resisted the Senator, and many others expressed dismay. 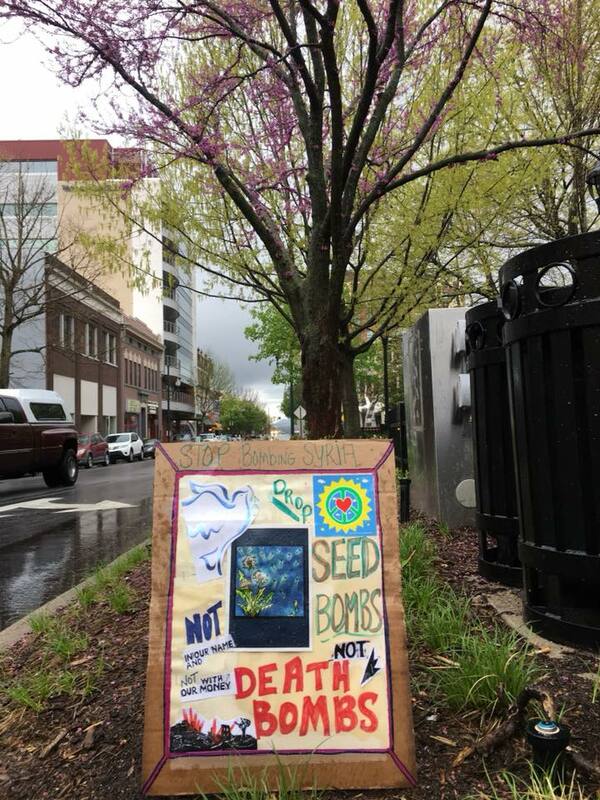 Following the Market Square action, the Bomb Plant Express traveled to Senator Alexander’s office where a statement was delivered to the Senator’s aide, Keith Abraham. Click here for the statement read at Alexander’s office. 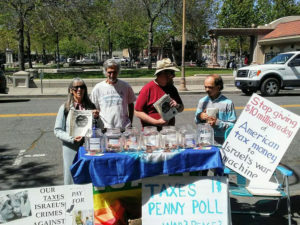 There was tabling, leafleting, presentations and outreach in towns and cities around the state. This year we had a calendar listing in the M, the Portland Press Herald’s entertainment insert. WBFY of Belfast interviewed Alan Clemence (see link below). Channels 8 and 13 expressed interest and then did not appear. We had great coverage by Channel 5 in Portland (see link below). Morgana Warner-Evans entered all of our events on various media calendars throughout the state. The hope this year is to call some of the major outlets and ask them what we have to do to get a feature. 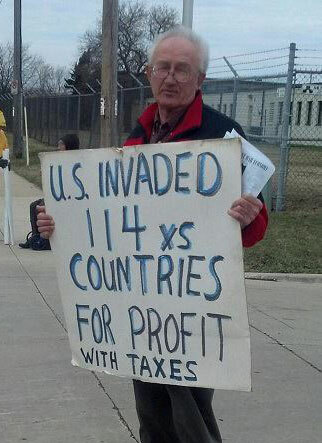 Milwaukee War Tax Resistance & Casa Maria Catholic Worker hosted two tax day protests this year. 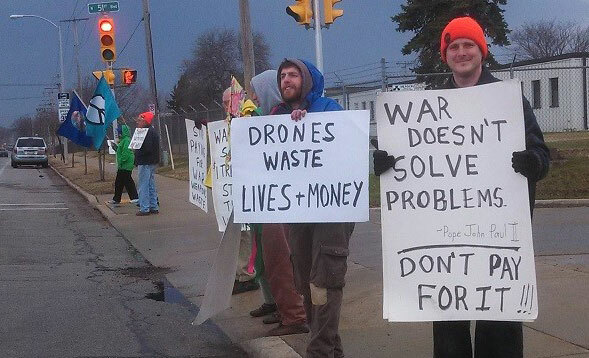 The first was a joint protest the Saturday before Tax Day with Peace Action Wisconsin. 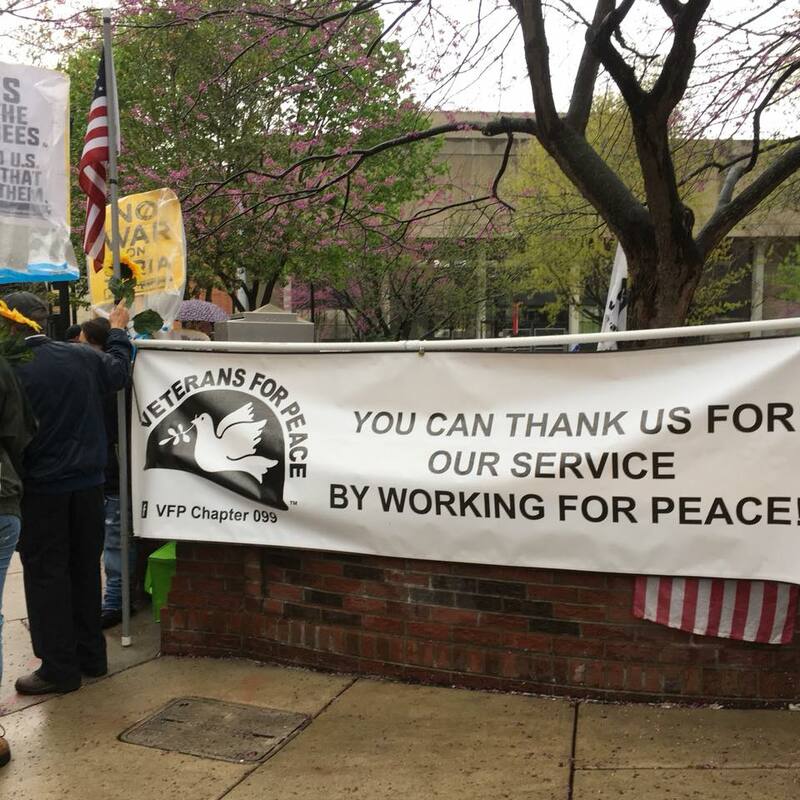 We joined with their weekly Stand for Peace (noon to 1pm), flyering in front of an Army Reserve Base. 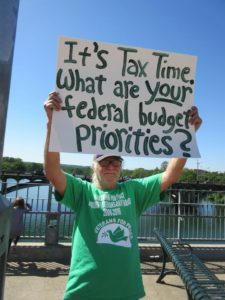 The second was on Tax Day (Tuesday April 17). A small group of us flyered in front of Milwaukee’s main post office during afternoon rush hour. 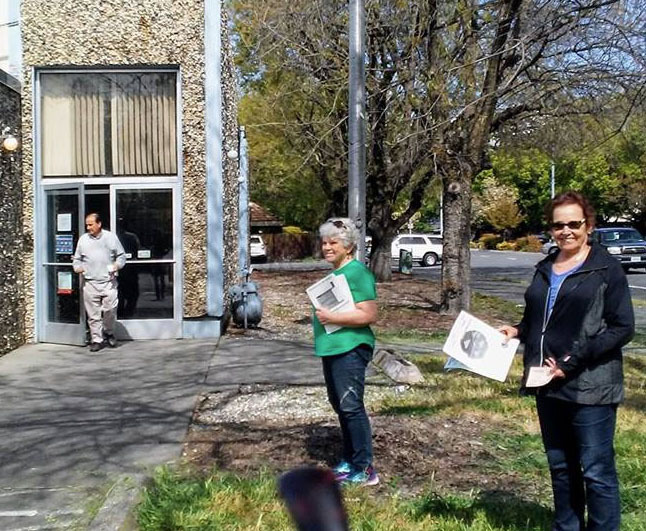 The post office itself was not very busy, but we showed off our signs to plenty of folks as they left downtown for their commute home.